Ever since I was a young girl in Girl Scouts I've been interested, perhaps concerned is a better word, about the environment. With that in mind, Earth Day is April 22nd. One of my cousins posted a very moving video on FaceBook about how everyone should plant a tree on Earth Day. We are looking into getting a fig tree to plant and join the movement. That video got me thinking about the environment and wondering if I'm doing all I can to help. There really are so many things individuals can do or not do to help the environment. We have a garden and a compost pile. I'm still driving my little 1995 Geo Metro. Insofar as Cajun Stitchery is concerned, I try to purchase 100% cotton, made in the USA fabric. Sometimes I can and sometimes I cannot but I sure do work hard searching and trying. It dawned on me that rather than throwing away scraps of fabric, which is nearly impossible for me to do anyway, I should make stuff with it. I do that anyway. That's nothing new. As I pondered this, I decided to make stuff from our old clothes, specifically our jeans. At first I was making some cute dog bones that I saw on the internet. 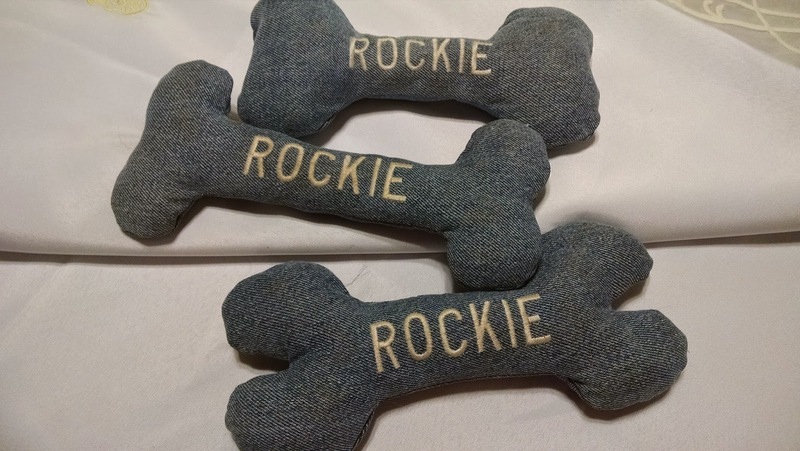 The dogs love them and they are made out of jeans. The shape is not perfect yet. One actually looks more like a wrench than a bone. Now I'm making plastic bag holder/dispensers. 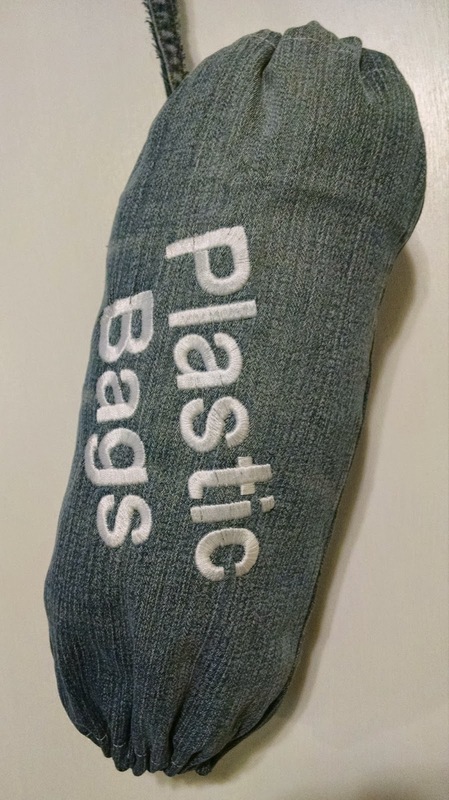 Years ago I made a plastic bag holder/dispenser for our home out of the leg of a pair of jeans. It really has stood up to time, even when my husband pulls and tugs at it. It is behind the washer hanging on a hook and you really have to reach for it. In addition, you simply wash it like you would, well, jeans. 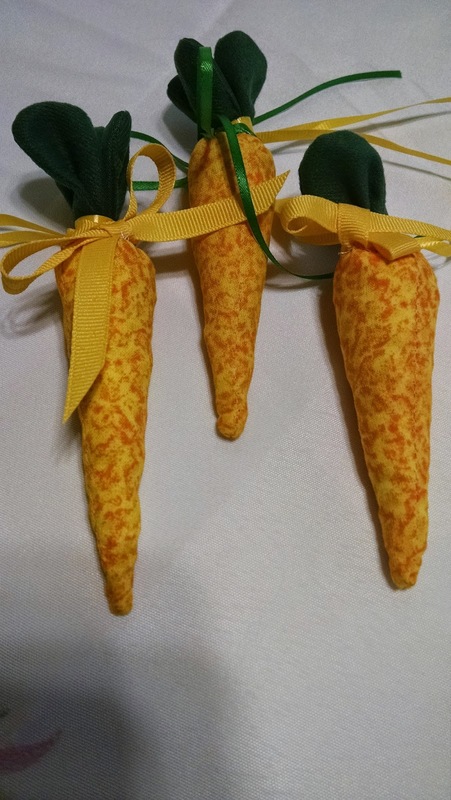 For Easter, I made these adorable fabric carrots from scraps of fabric and stuffed them with small pieces of scrap fabric. There is a new category in our Etsy Store called "Reduce, Reuse, Recycle." The intent is to sell items reusing/recycling scrap fabric, clothes and whatever else seems applicable. Your positive comments are always welcome. I've found about 13" tall is a good size for us. Cut off a leg from a pair of jeans. Give yourself a good 15" or so because of the hems. Cut off the bottom hem on the jeans. It's just too bulky. Sometimes, if the legs flair, I'll simply make them straight by cutting the sides straight (finish the raw edges and seams each side). Serge or otherwise finish the raw edges at the top and bottom. If the jean legs flair, simply make them straight by cutting the sides straight (finish the raw edges and seams each side). If you are going to monogram or embroider anything, now is the time. Just make sure the embroidery is centered the way you want. Turn the finished edges at top and bottom inside about an inch. Sew the hems leaving enough room to thread elastic through. Also, leave an opening to insert the elastic. Next, insert the elastic. I thread the thin elastic through, tie it off, and then cut the elastic. Usually the bottom is pretty tight to allow only one plastic bag out at a time. The top needs to be tight but loose enough to stuff the plastic bags into it. The final step is that I cut about a foot or two of that heavy felled seam that runs the side of the jeans. Just cut it and make a long strip. Double it up and tack it onto the side of the bag, or wherever you want the strap. If you don't understand any of these instructions, please do not hesitate to contact/comment and I'll be glad to try to help you out.